It’s an age-old question: ‘how do you like your eggs in the morning?’ Now, the nation has spoken: soft scrambled is Britain’s favourite way to enjoy the old breakfast faithful, with 40% saying eggs are their favourite food, according to new research by accommodation software provider eviivo. The study, conducted ahead of National B&B Week, questioned the British public to discover just how they like their eggs in the morning once and for all. Soft scrambled came out top, with soft-boiled, poached, and fried sunny side-up featuring as other popular choices. Baked eggs are bottom of the pile, with only 2% declaring the dish as favourite way to eat eggs. On average, Brits tuck into 96 portions of eggs a year, with Londoners eggspecially keen, scoffing down 108 portions, the most of any region in the UK. This may be why Londoners reckon themselves the best egg chefs, with 53% rating themselves better cookers of eggs than their friends or family. 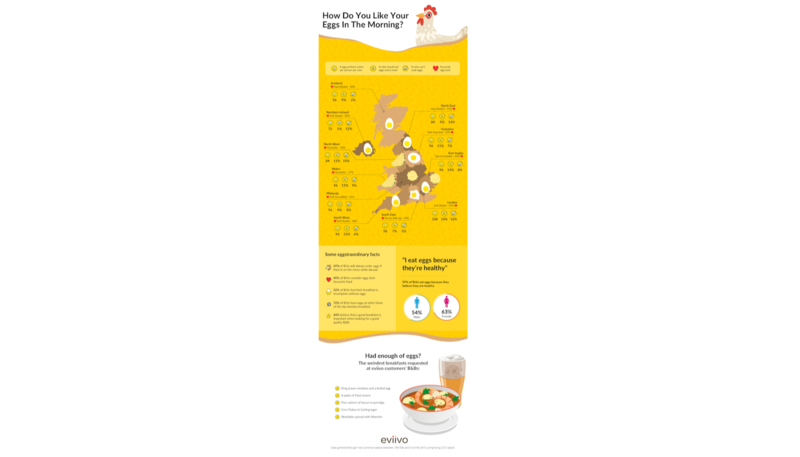 The most intense egg eaters in Britain are from Chelmsford, with 25% of respondents saying they eat more than 20 eggs each month (compared to a nationwide average of 5%), whilst 59% of respondents from Coventry state that eggs are their favourite food. (73%) admit to eating them at other meal times. More than a quarter (26%) say they would eat eggs for every meal of the day if they could, and a whopping 70% say they always choose them if they are on the menu on holiday. Delving deeper into the data, health consciousness is one of the key factors for eggs being such a crucial part of Brits’ diets, with almost two thirds (59%) saying they eat eggs because they believe they are healthy. Despite this, 20% of Brits don’t know how to cook an egg, with Londoners being the worst offenders – shockingly more than a third (35%) are unable to make eggs of any type. Our survey also shows that the ability to cook an egg is generational, with only 9% of over 50s unable to cook an egg, increasing to 30% for under 30s. National B&B Week takes place from 18th-24th March 2019. The week-long event aims to show Brits that a staycation can be just as good as a holiday abroad, and will feature a range of offers and activities taking place at B&Bs across the country.